Jofnir Iceblade was a Nord warrior and the former guildmaster of the Fighters Guild before Sees-All-Colors. He kept quarters in Vulkwasten, Sentinel, and Fort Amol. "I am Jofnir Iceblade. Former master of the Fighters Guild. Don't interrupt, I cannot speak long. Doshia has taken Merric beneath the island, into the vault. She drains his soul for her master's dark plans." "I can't... I can't say. My time grows short. 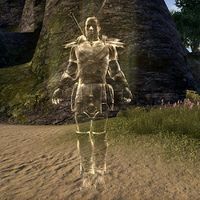 Save Merric, stop the Daedra. Ware the followers of Molag Bal..."
After revealing this information, Jofnir disappears. "You're in danger. Danger I can't fully comprehend, not even in death." What kind of danger? Why can't we talk about this danger? "Someone close to you has plans... plans for us both. Plans to betray you. I am anchored, contained ...pulled away... beware, comrade!" After delivering this warning, Jofnir disappears once again. Following this exchange, Jofnir vanishes. This page was last modified on 23 January 2019, at 04:34.